Ask most Americans to name a beautiful travel destination and you’ll receive answers like the Pacific paradise island Bora Bora, the famous Patagonia in the Andes Mountains, or even the Amazon rainforest. At least, these were the answers my friends provided me. There’s something undeniably alluring about far-flung places in the corner of the world that we’ve seen only in magazine spreads or on social media. But we are often blind to the beauty that lies in our own backyards, or perhaps there’s just something inexplicable about being in a foreign country that allows us to fantasize hiking in, say, the Swiss Alps, but not hiking in the Cascade Mountains (indeed, my friends didn’t even know that the Cascades are in the U.S.). 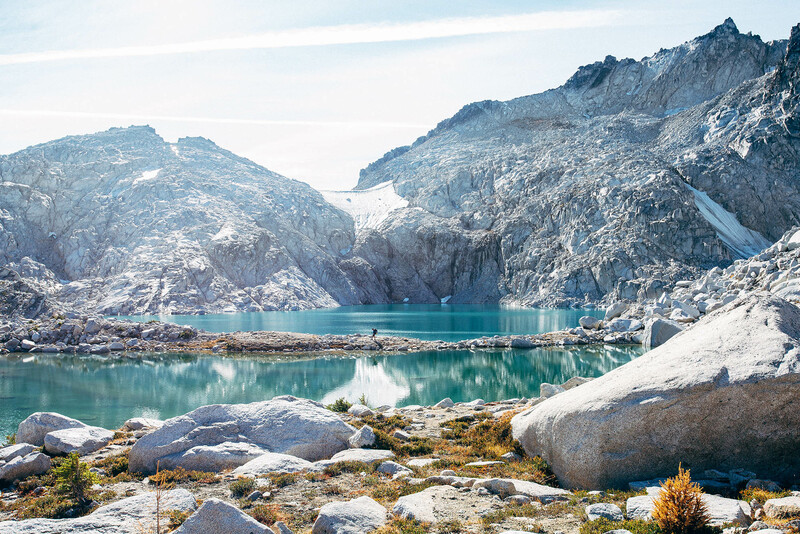 I’m certainly guilty of this sort of daydreaming myself (my bucket list includes places like Iceland and the Julian Alps of Slovenia), but I set out last fall to complete an 18-mile hike in the Enchantment Lakes Basin in the Cascades. The Enchantments are truly a wonderful place. 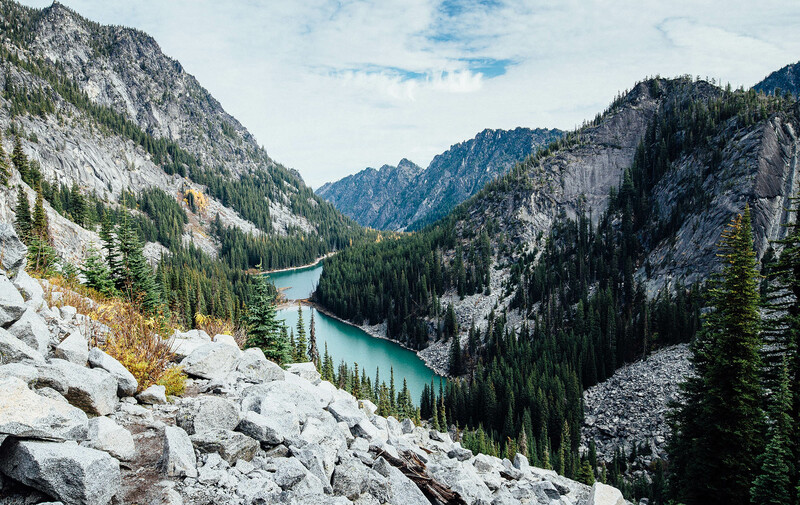 The Enchantments are a chain of high alpine lakes in the Cascade Mountains of Washington. 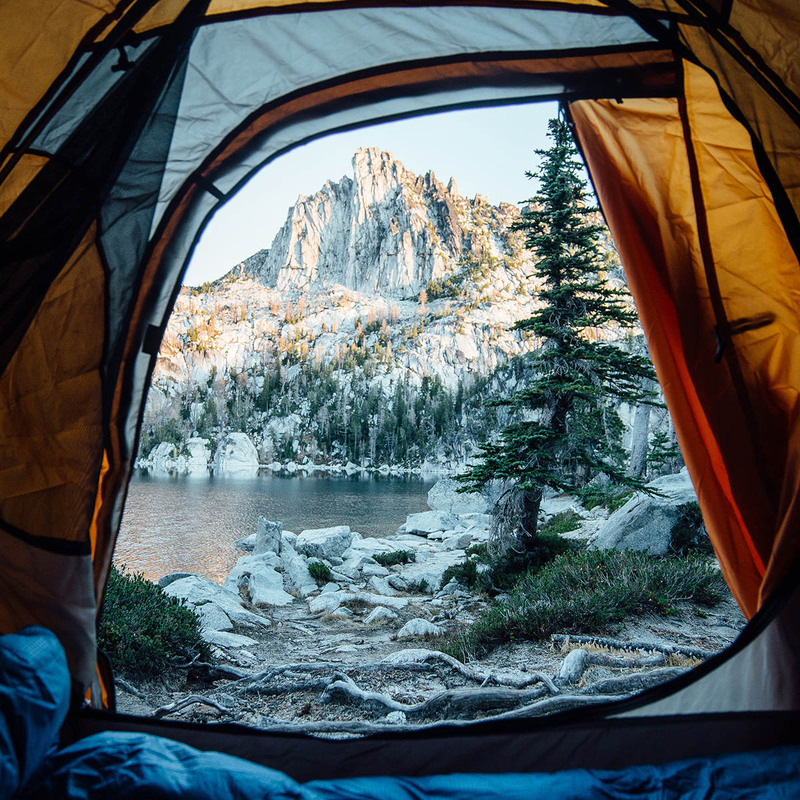 During the summer months from mid-June to mid-October, there is a permit system in place limiting the number of people who can camp overnight in the basin, due in part to overuse problems stemming from its popularity (it’s less than three hours from Seattle). 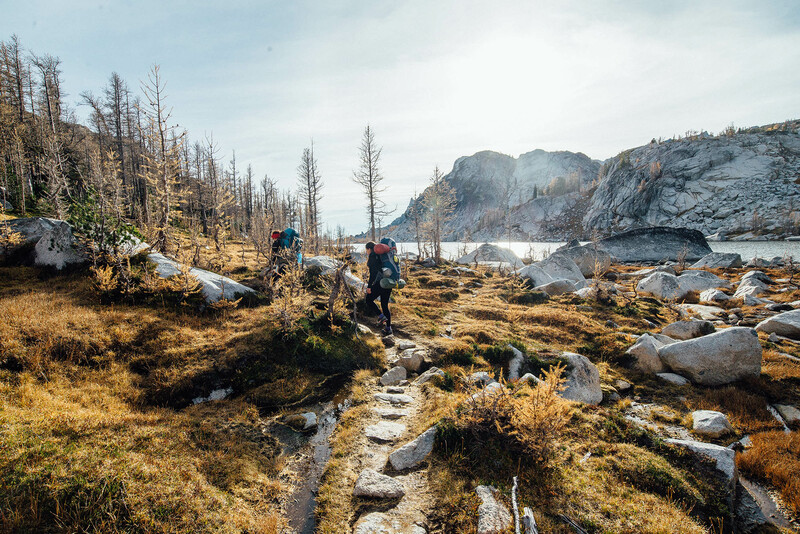 I first read about this place on the incredible Enchantments Guide site by Hum Creative enchantments.guide and immediately put it on my list of must-do hikes. Despite the relatively short length of the trail, the Enchantments are bursting with magic at every turn. From the pristine beaches of Colchuck Lake to the golden larches of the lower basin and the barren, moon-like granitescapes of the upper basin, it is immediately obvious to all who go there why the Enchantments are regarded as one of the most stunning locations in the Cascades, and perhaps the U.S. 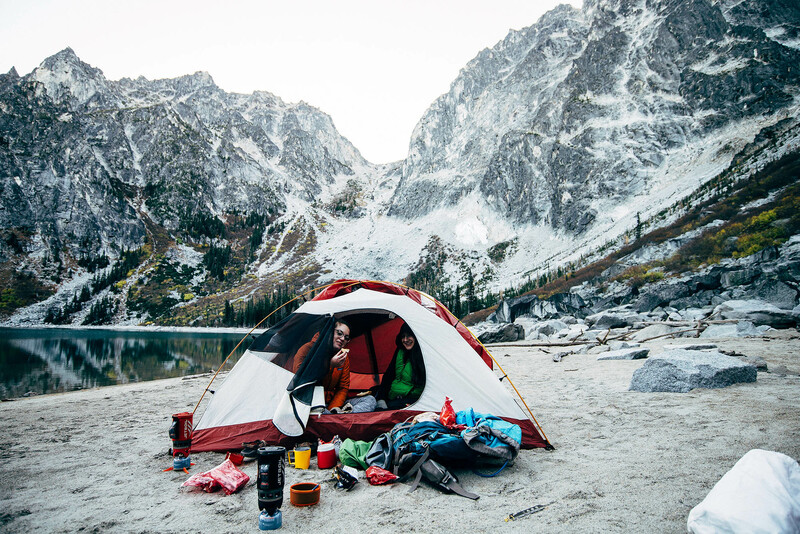 The first night’s campsite on the shores of Colchuck Lake. With three people in our group, we set out in mid-afternoon on a Tuesday to cover the first six miles to Colchuck Lake. It was a fairly chilly October day – a high of 50°F – but we were fortunate that the high peaks hadn’t received any snow yet. For now, we chose only to think of how luxurious it was to camp on the sand rather than the boulder field above us. 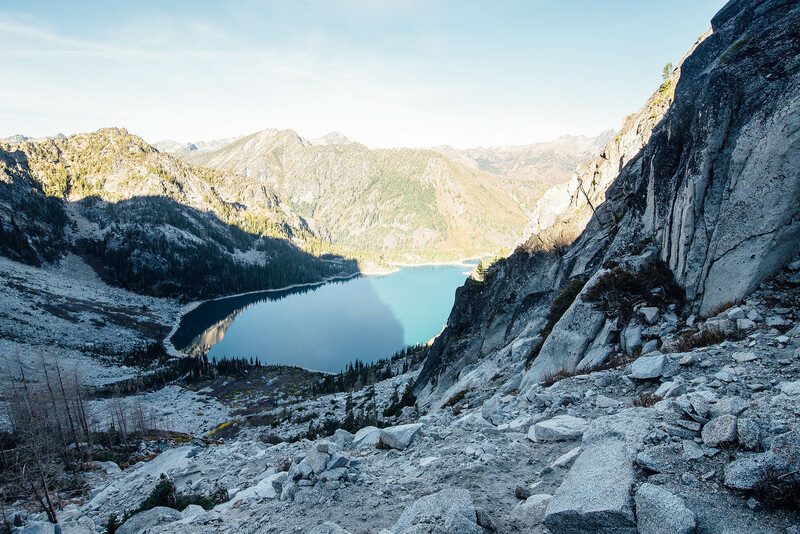 We knew that the next day would take us over the infamous Aasgard Pass and up into the Core Enchantments zone, where the real fun would begin. But from our humble campsite by the lake, we couldn’t make heads or tails of which way the trail went (hint: it’s the steep gully in the center background of the above and below photos). 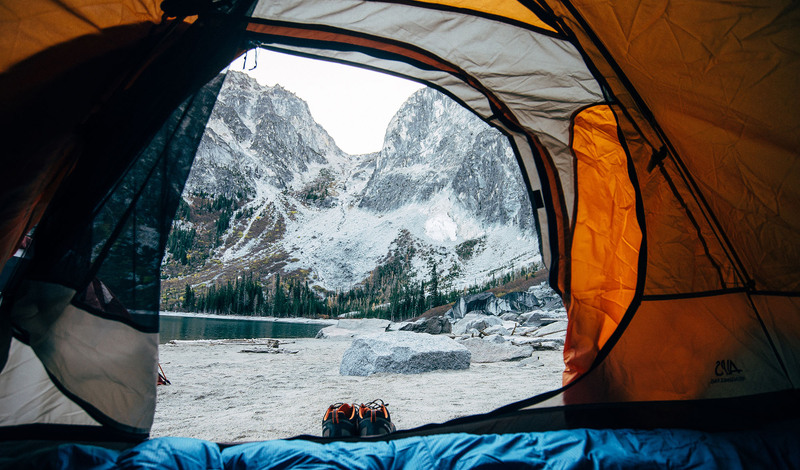 Waking up on the shores of Colchuck Lake. Aasgard Pass in the background. From the base of the pass, it seems an impossible task to ascend a path so steep without proper climbing equipment, but it is indeed possible. At times, it seemed like we were boulder-hopping rather than following any well-defined trail to the top. Each time we looked behind us, the lake appeared smaller and smaller until it disappeared from view entirely and we were thrust into a world of white granite rock and crystal blue lakes. Looking back down on Colchuck Lake from near the top of Aasgard Pass. Immediately, we were greeted by Tranquil and Isolation Lakes. This was a place where trees ceased to grow and the ground was a combination of desert-like sand and smooth, solid rock. And yet, life still found a way to flourish here, if the couple of mountain goats we saw were any indication. At Isolation Lake, a narrow channel separated the lake proper from a small tarn. I passed my camera to Renae and ran over to pose for a photo. This ended up being, in my opinion, the best picture from the entire trip and I wasn’t even the photographer! There’s just something about mountains reflected on an alpine lake that’s sublime. Our goal for the second and final night was to make it to the lower basin. It seemed to be an easy goal – just three miles further, and we’d only hiked a mile so far – but the going was far slower than we’d anticipated. There were many stretches where the trail meandered over steep granite slopes and boulder fields and we had to use our hands for balance. Hilariously (in retrospect), it took us the better part of eight hours to hike four miles. That’s about half a mile an hour, if you don’t count snack breaks. Granted, they were probably some of the toughest four miles I’ve had to hike with a heavy pack on my back, but we were able to take our time and really enjoy the landscape. Larch trees still in season by Leprechaun Lake. The larch trees in the Enchantments are usually green, but for a few weeks in October, they transform in a fiery display that marks the beginning of autumn. While most of the larches around Colchuck Lake and the upper basin had already shed their leaves for the season, we were fortunate enough to bear witness to the golden hues in the lower basin. Living in the northeastern U.S., autumnal displays of color are nothing new to me, but I had never hiked in a high alpine region in the fall before. It was breathtaking to see the yellow in stark contrast to the grey mountains and blue lakes. Even as we descended into the lower basin, the larch leaves strewn all across the ground were beautiful in their own way. Rachael and Renae walking along the shores of Perfection Lake. We pushed onward to the final lake in the Enchantments Basin: Lake Viviane. Camping here was a bit of a challenge as most of the feasible campsites were on the eastern shores and already occupied. We spent a good half hour scouting for an adequate plot for ourselves and eventually settled on a rocky, root-filled area right on the southern bank. The last day on the trail was the longest for us mileage-wise, although it was all downhill from this point. Overnight, the winds across the water settled and Prusik Peak was reflected perfectly on the lake’s surface. Here we were, just 80 miles from Seattle in the Cascade Mountains. 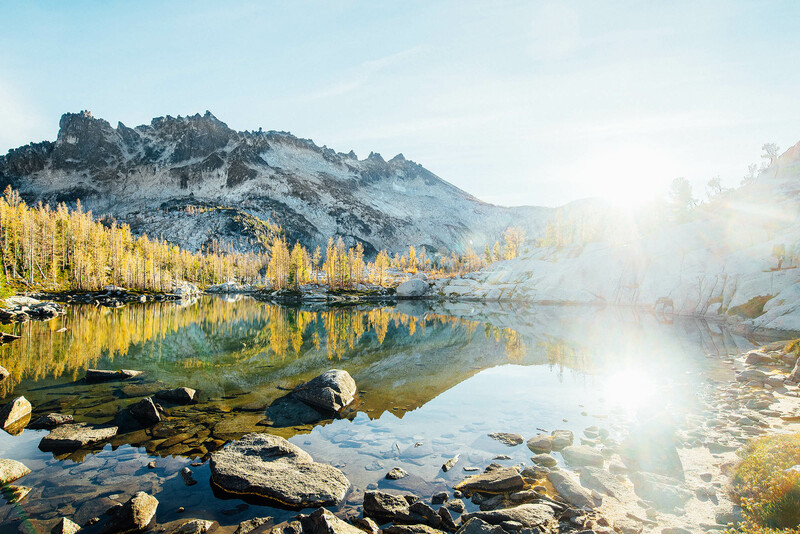 To Washington locals, the Enchantments are no secret. But to me, an outsider, it is astounding that such natural beauty exists in one of the most densely populated corridors of the U.S. 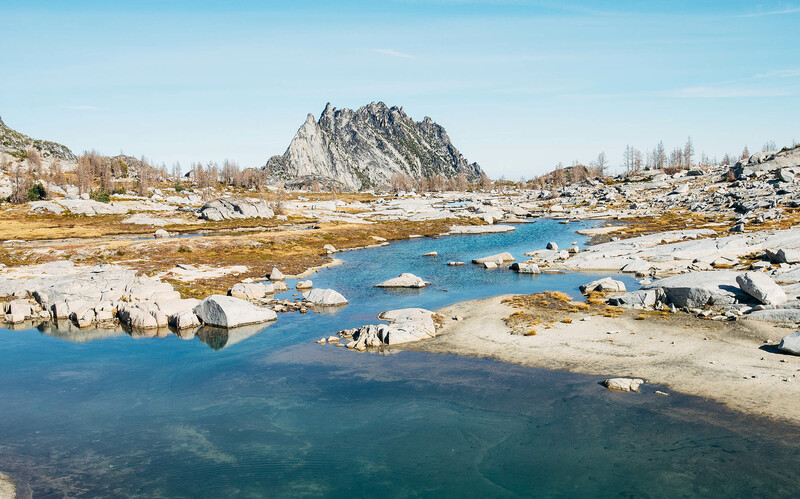 I had only heard of the Enchantments a few months prior, but can firmly say that this place should be on every hiker’s bucket list. We didn’t have much time to spare though and ate a quick breakfast and filtered some drinking water before diving right back in. This was Renae’s first backpacking trip, and while on paper it doesn’t sound too bad – 18 miles over the course of 3 days – the terrain was challenging enough that it would make for quite an experience for a first-timer. I know I probably wouldn’t have liked backpacking as much if this was my first major trip, but I digress. I definitely give major props to Renae for getting through in one piece! Despite the physical challenges, we were in good spirits on the descent, though the terrain was tiring. We made it to our car in the late afternoon and celebrated with proper food – burgers and fries from the nearby German-themed town of Leavenworth. My biggest takeaway from this trip, in retrospect, was that one can find worthwhile places to visit anywhere in the world. Of course, our curiosity often draws us to places we deem “exotic” or “foreign,” but all too often, I find myself planning trips to other countries when I have free time. Where the outdoors is concerned, I’ve learned to focus on destinations in the U.S., which is filled to the brim with magical places from the Cascade Mountains to the Wind River Range to the White Mountains – places that I can guarantee from experience absolutely match the beauty of the Swiss Alps or New Zealand landscapes. Overlooking Nada Lake on the last day of hiking.